Getting there: From Austin head north west on Highway 183. Turn left and head west on Highway 29. 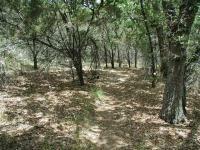 Turn left on Park Road 4 and proceed south for about 3 miles to the Inks Lake State Park headquarters. Trailhead parking is located a few hundred feet behind the headquarters in the separated parking area. The Hikes: Inks Lake is one of the smaller Highland Lakes that were created by the dams that the Lower Colorado River Authority created in Central Texas. At one time I was not too sure that the relatively small park, with some of its acres taken up by a golf course, would provide much in the way of hiking. Friends who had been at the park testified to it's virtues, but theirs interests were in the golfing and boating opportunities. A closer inspection of the park's trail maps provided some hope, though the map did not provide a full representation of the trail due to the map's layout, so some uncertainty remained. After hiking a good portion of the trail system at Inks Lake I now know that this park does provide much for the hiker, a whole lot more than I originally expected. The only creek crossing of any significance includes a bridge. The hike started at the waypoint marked "Trailhead". This is conveniently just a few hundred feet from the main ranger station at which one pays the park entry fee. The trails at Inks Lake feature trail maps carved into wood at several major trail junctions and here at the trailhead. A posted sign indicated that the park is experimenting with a way to mark trails using colored tape. It's not clear whether the experiment is continuing as I did not notice much tape along the trail. This photo sums up the hike at Inks Lake. There's brush, there are trees and cacti and there's lots of bald rock. The trail gradually descends toward the south and brushes against the shore of Inks Lake before turning more to the southwest. Along the lake shoreline it becomes apparent that the most striking feature of Inks Lake is the abundance of granite rock outcroppings. Large boulders either litter the landscape or huge domes of granite burst from the Earth like a permanent bubble. At times the trail can be slightly hard to follow when it traverses the granite outcroppings because even the feet of thousands of hikers does little to wear down the stone. 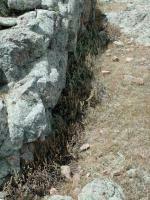 Look for lines of rock that previous hikers have laid down as a guide until the trail becomes more apparent. 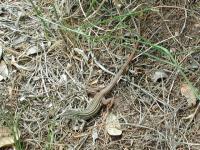 We saw a large number of these lizards along the trail. Most ran off into the underbrush when approached. This one was a bit more curious. After the initial waypoint marked "Y-Left" the turns tend to be rather simple for some time. In an effort to extend the hike keep choosing right turns where possible until almost the end of the hike. Because of the large number of open spaces due to rock outcroppings one must take care to protect oneself from sunburn while on the trail. There are few densely wooded areas along the trail, but they are not the norm. 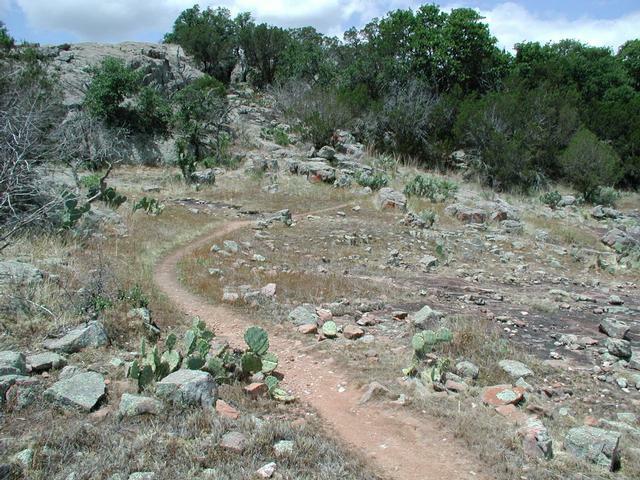 When not scampering over bare rock the trail typically meanders through scrub oaks and Mountain Juniper, typical Hillcountry flora that also expose hikers to plenty of direct sunshine. Views of nature are not the only things to be seen from the trail. 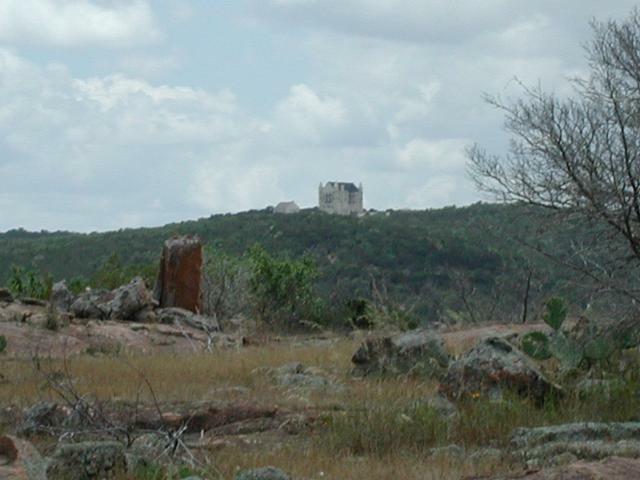 Here's a castle, right here in the Hillcountry. The waypoint "Overlook 1" marks the first spot of many that provide fantastic views. 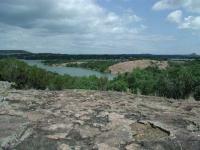 Here one can look down on the Hylton Branch arm of Inks Lake and some of the park land on the opposite shore. A huge granite outcrop dominates the view. Although somewhat reminiscent of Enchanted Rock this batholith pales in comparison when it comes to size. Chances are one would encounter far fewer people upon reaching the top however. There is some shade during the hike such as this section, but open skies are more of the norm. So wear your sunscreen! The "Road Cross" waypoint is not very dangerous. The amount of traffic is not excessive and drivers typically keep their speeds under control since they are enjoying the sights around them. But this also means that they are likely not on the lookout for hikers. So proceed across the road with caution. As is often the case, the back portion of the hike is the most enjoyable. 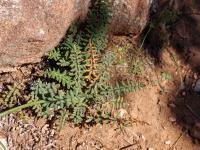 The vegetation is slightly heavier, particularly towards Peter Creek, so there is more shade that elsewhere. However the reason why this part of the hike is more enjoyable is because the trail moves away from the park road, lures fewer visitors out to its periphery and includes some stunning views and rock formations. Towards the southern-most part of the hike look in the general direction to the east and catch a glimpse of a castle. Yes, a castle. Someone os well-to-do means has built an enormous castle on a high hill off in the distance. It's not every day that you see such an edifice in Central Texas. Occassionally it's hard to follow the trail when it crosses rock outcroppings. 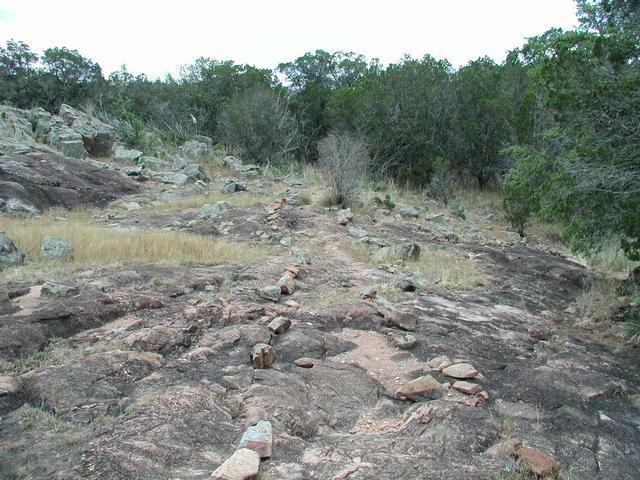 Previous hikers have made the way more apparent with guiding lines of stone. At the waypoint "Two Rocks" the trail passes between huge granite boulders. The undersides of the boulders appeared to have an odd shadow, which upon closer inspection turned out to be the largest group of Daddy Longlegs I have ever seen. Several colonies inhabited every facet of the boulders that provided a cool retreat from the Sun. Not only were these colonies holding an enormous number of Daddy Longlegs, but they were also very densely packed with bodies against the rock and their long legs bend upward. After several right turns, we turned left at the waypoint "Y-Left". This shaved perhaps a mile from the hike as the trail to the right would have looped around the primitive camping area. Not far down the trail, the second overlook on the hike at the waypoint "Overlook 2" provides a view similar to that available at "Overlook 1". The perch here is somewhat higher and farther back from the lake. Along the trail are several great views of Inks Lake. This spot sits on a granite dome and another dome can be seen across the water. Toward the end of the hike I heard a slight rustling in the brush and paused to try and get a bearing on its source. After a few moments I spied an Armadillo about 15 feet away foraging through the leaf litter and completely uninterested in our presence. 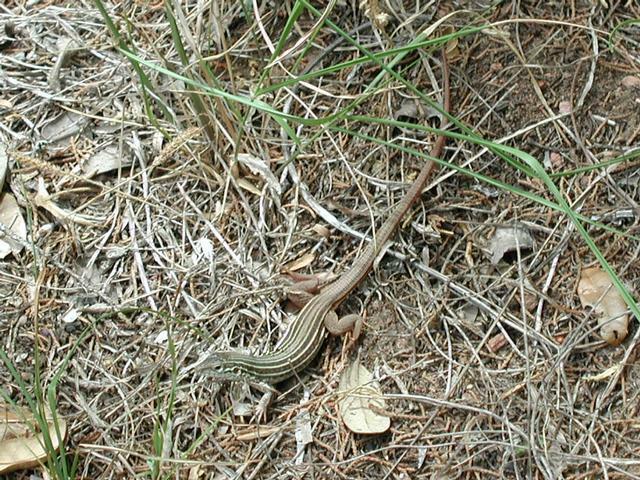 By the end of the hike we had spotted an armadillo, deer, road runners, several lizards, grasshoppers too numerous to count and several different species of bird. It provided one of the most abundant collections of wildlife that we've seen in the area. The waypoint "T-Left" marks the homestretch for the hike. The trail heads west, crosses Park Road 4 one more time and then rejoins the trail followed on the way out soon thereafter. Follow the trail back to the north towards the trailhead to complete the hike. This writeup describes a loop of approximately 5 miles. 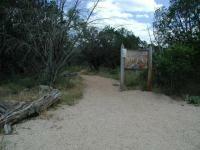 A few feeder trails and a loop extension that leads to the west to the primitive camp ground increases the length of the Inks Lake Trail system to the park reported 7 miles. Inks Lake provides a rewarding hike on many different levels. 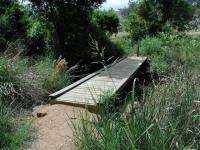 The back trails are reasonably quiet and remote despite the trail's proximity to Park Road 4. There's an abundance and variety of wildlife to watch and there are plenty of rock outcroppings over which to crawl and climb. 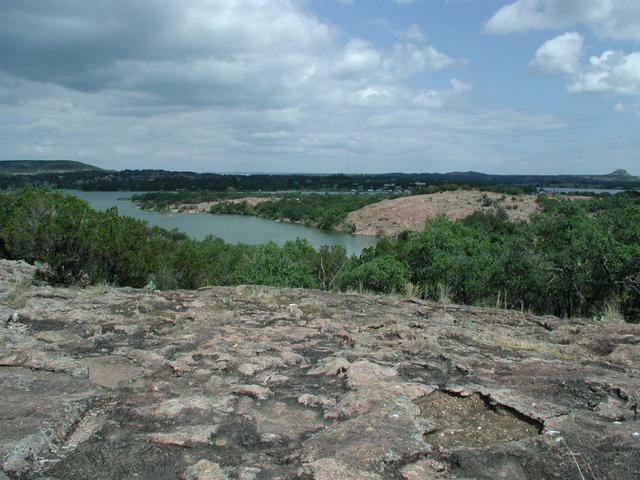 Inks Lake has a lot in common with its neighbor, Enchanted Rock, but minus the giant dome. 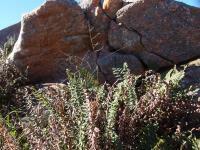 It's part of the same Llano Uplift of pink granite, though, so it's similar in plants and hummocky pink boulderiness. Superficially, it might seem like any other part of the Hill Country, but because it is based on granite rather than limestone, the geology is very different, and the region hosts ferns, spikemosses, quillworts, and yuccas that are distinct to this area. While still very popular, Inks Lake is MUCH quieter than E-Rock, and it isn't hard to find some solitude. We did the blue, which is most easily accessed from outside the park (i.e. free). We thought it was a pretty nice trail. I decided to do some primitive camping at Inks Lake, so I did this hike slowly with a full backpack. I started my hike at the Green trailhead, hiked down towards the lake and explored the various offshoots of the Green trail, then returned along the lake to the Blue Trail loop, to the Red trail cutoff and finally to the Yellow Trail to the Pecan Flats Trail Camp. The next morning I took the Yellow trail back to the Green Trail to my car. I found the lake to be scenic, but the trails were boring. The only interesting thing about this park was the rock. It wasn't the typical limestone/sandstone you see in a lot of the hill country, but more of a harder granite. 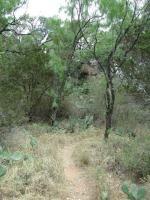 Hiked green trail, blue trail, part of red trail, and part of yellow (Pecan Flats) trail. Because of high temps and work; we haven't been out to Inks Lake for a while. With cooler temperatures and being on vacation we ventured back to the trails . The trailheads were marked well but trails were lost due to nature in some areas. There were quite a bit of cactus so the dog needed a very short leash. Other than that, Inks Lake State Park is still a great hiking area with different difficulties on each trail. Lots of birds and a couple deer made it an enjoyable day. This is a great hike, especially when you cross the highway and get up into the isolated hills and rocks. 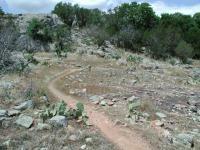 Lots of climbing and great views of Inks Lake and the surrounding hills. Inks is a great place to camp too, with lots of things to do. Attempted to take the green loop on this cold weekend (there was still some ice in a few places). Had some trouble staying on the trail since I hadn't initially noticed the green dot markers painted on the rocks in the more sketchy areas. Very nice, rugged area. My wife and I took our 15 month son on part tof the green trail. It wasn't marked very well so ended up just finding way back to road then to parking lot. But was good was to get out of house and walk off some of Thanksgiving dinner.